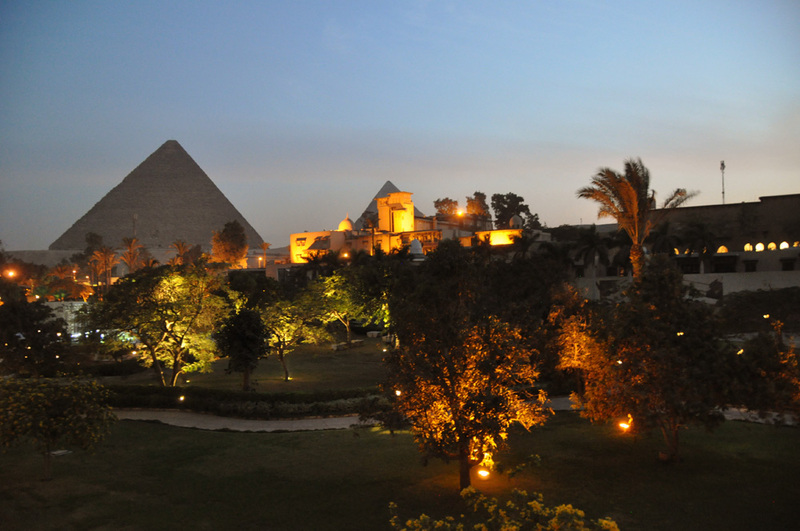 Arriving late into Cairo airport from London Heathrow, we arrive at Mena House in the dark; the taxi journey is around an hour, and our flight landed at 9 o’clock at night. 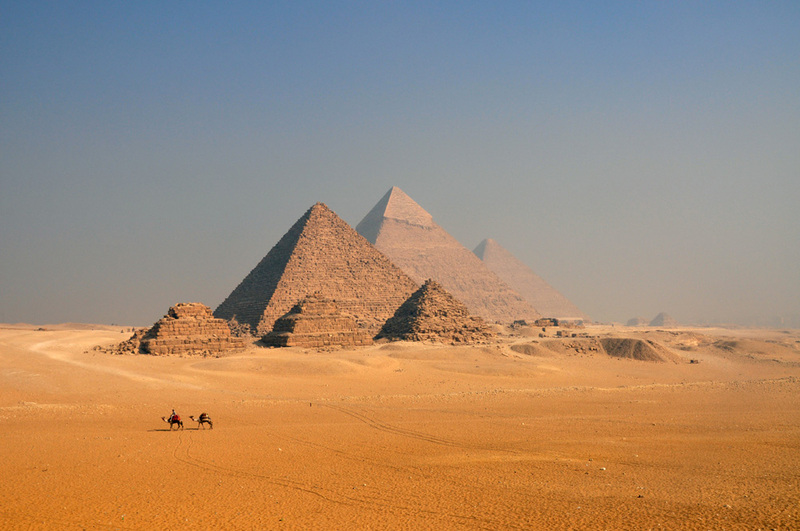 We awake in the morning to a view of the last remaining great wonder of the ancient world – the Great Pyramid. 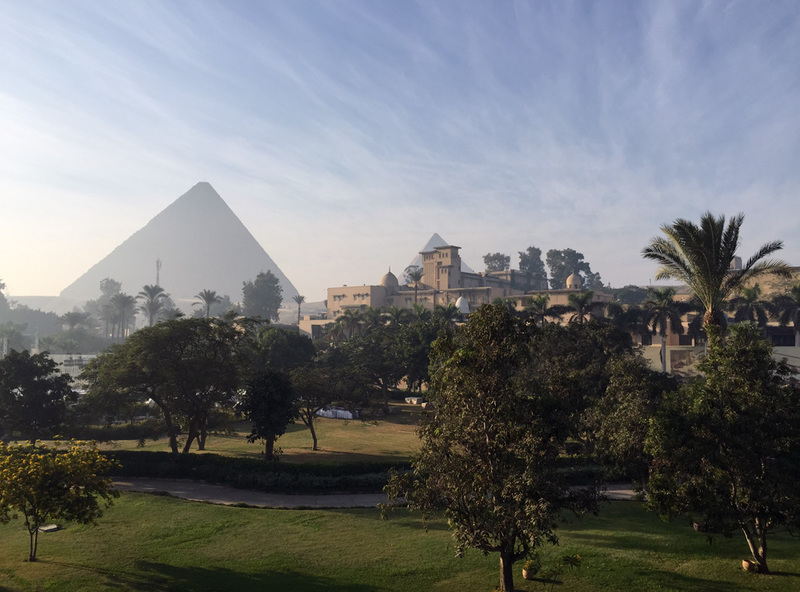 We gaze from our balcony as the pyramid rises above the hotel in early morning haze. We’re in the modern block, but with a pyramid view (obviously), as opposed to a garden view. The garden view rooms look over the pool but also the security fence and the rather shabby blocks across the road. We just have a beautiful garden and the pyramid thing. Mena House has a great history, starting as a simple hunting ledge and then, after the opening of the Suez Canal, as an english-run hotel. It’s seen its fair share of famous guests with perhaps the Churchill-Roosevelt-Chiang Kai-Shek meeting to discuss Operation Overlord [D-Day] the most significant. Later, in 1979, it saw the historic meeting of President Carter, President Sadat and Prime Minister Began as a prelude to the Camp David Peace Talks. Whew…and we just came for the pyramids. As a base it was great, typical of many luxury chain hotels – not special, but with presence and history. Closely guarded with security screening and sniffer dogs before you even get into the grounds. Nice Indian Restaurant. We ventured into Cairo – Tahrir Square – to visit the Egyptian Museum. The museum was virtually deserted, a situation we were to come to recognise throughout our trip. The museum’s displays were, how shall we say, basic; hopefully they will improve with the opening of the new museum next year inshallah. Still, the exhibits themselves are astounding but, without any labels or description, you are forced into using a guide [about £18]. All the great Tutankhamen pieces are there, and no queues – we walked right in. We saw no problems, although there were plenty of tanks around the square – as with much of Egypt. Plenty of armed security to protect the tourists – you get used to both uniformed and plain clothes people carrying a variety of machine guns – but we still felt quite safe.